Required for Step 4 History! This course develops literacy, vocabulary, an understanding of literature, as well as provides some history and related study. Ready to have your student LOVE reading? Ready to have your student understand the ideas that a good book offers with greater depth and enthusiasm? The big ideas and activities are here and ready, in complete daily lesson plans. This course can help! This book is required as part of Step 4 History, and this is the best way to experience the book. The richest and most complete of all our literature guides! Siddhartha, written in 1922 by Swiss/German author Hermann Hesse (and translated into English that same year by five different translators, to create the version we use), is the world beloved novel about the life of a deeply spiritual young man seeking truth, who encounters the Buddha, 2,500 years ago. Over 100 million people have read this profound, exhilarating work, in over 60 languages. It's the kind of book that can change a life. Here's a truly complete guide that will help your student, ages 11-adult, understand this book as few readers ever do. 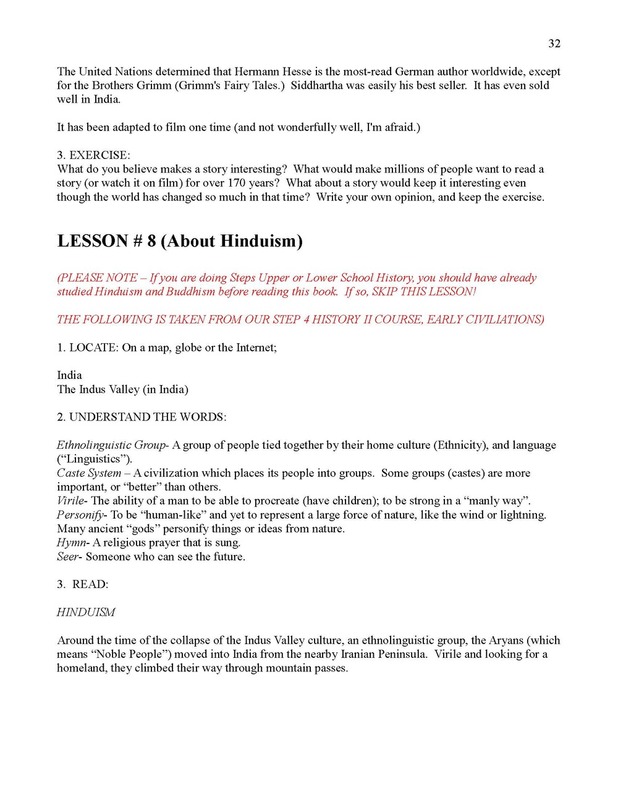 Even before the student gets into the novel, he is led through a study of Hinduism and Buddhism, what they are, how they started, what they believe. It is essential for the reader of Siddhartha to have some understanding of these eldest of Eastern faiths, and this literature guide provides, with lesson plans borrowed from our Step 4 History 2 course covering Early Civilizations. The history of the period of time is explained, so that the student understands why Hesse wrote the book, and what he was trying to say to his readers about their time (and ours). Pulitzer Prize winning writer Hesses's personal history is also explored (in his own words! ), and the student relates what he's learned about Hesse's' life to the story, and how Hesse's' own experience helped to create this masterpiece. The history of the book itself, its publishing successes is considered. This is a complete study guide, one that will bring this great work to life, and which should help interest the student in literature and in this great masterwork. THIS BOOK IS REQUIRED READING FOR STEP 4 HISTORY 2, EARLY CIVILIZATIONS. STUDENTS DOING THAT COURSE WOULD SKIP LESSONS 8-13 IN THE LITERATURE GUIDE, AS THEY ARE COVERED IN THAT COURSE.